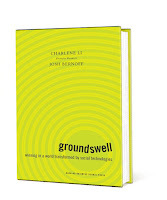 I added another book to my list - Groundswell. Each of my clients is getting a copy - it's a great discussion of the social media opportunity. Most important, it looks at the phenomena not from the technical perspective, but from the direction of how social media is changing the relationships people have with their friends, colleagues, family, etc. Ultimately, these changes will also impact a brand, presidential campaign, or any other organization that relies on marketing and public relations to get its message out. 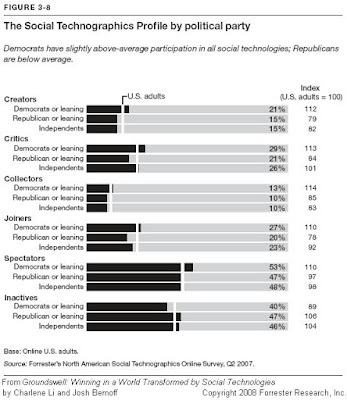 I have long had the sense that Democrats & Progressives dominate the social web, as the Republican & Conservative movement has long dominated talk radio. This, in conjunction with the tremendous opportunity brewing on the business & marketing front, has driven me to help major Democratic political organizations realize and seize this growing opportunity. It's always nice to find empirical data to support your gut.